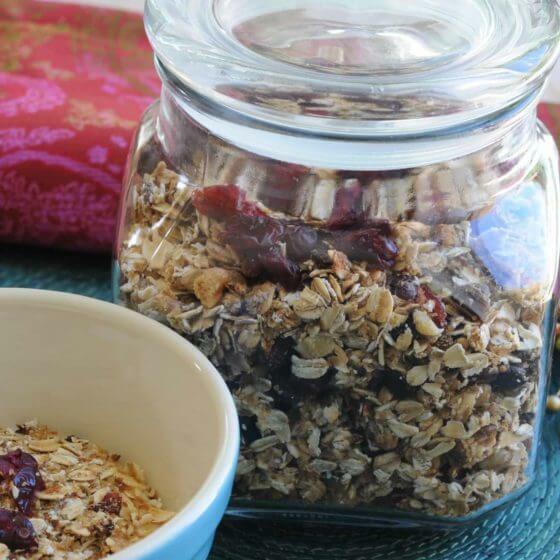 Cooking Tips: Watch your granola carefully and make sure to toss it often so that it cooks evenly. Don\'t let it get scorched! In a large baking pan toast the oats in a 350 degree oven, stirring every 3 minutes, until golden (about 9-10 minutes). In the microwave or a small saucepan, heat the honey just until it liquifies. Pour into a large mixing bowl and stir in the cinnamon and almond extract. As soon as the oats are toasted, add them to the honey mixture. Stir quickly to coat everything well. Spread the mixture into the baking pan again and return to the oven for 5 to 6 more minutes, stirring once or twice, until just starting to brown. Allow the oat mixture to cool in the baking pan then stir in the wheat germ and dried cranberries.